As you step on the beach, an unknown force urges you to sprint full speed into the salty sea. While children can’t seem to resist this pull, adults have learned to restrainedly stroll to the water, touch it with their toes, and return back to their chairs to relax in the sun. But the fact remains: the sea is beckoning you. Answer the ocean’s call with Florida panhandle fishing adventures. Whether you choose to surround yourself in deep blue offshore waters or simply hang out on the beach with a rod, you’re sure to find a connection with the sea. Need help planning your trip? Download our free Vacation Guide to discover the best outdoor excursions, restaurants, and events to make the most out of your beachside getaway. One of the best offshore fishing charters you can find is with Last Local Guide Service, located just outside of St. Andrews State Park. When you take part in their Reef Fishing Tour, you’ll find yourself in a half-day pursuit of the “heavyweights” of the sea like grouper, snapper, amberjack, and king mackerel. They also offer extreme excursions like the Dolphin & Island Tour, which allows you to swim with bottlenose dolphins, explore a remote island, and snorkel along the coast. Their adventurous offerings aim to immerse you into the oceanic environment. The Choctawhatchee Bay is known for more than it’s prestigious golf course and delicious dining destinations. Embark on an inshore fishing charter with Shallow Water Expeditions for a day in smooth, protected waters. In this bay, you’ll have the opportunity to catch bull redfish and jack crevalle, which each average a whopping 20-25 pounds. Taking this relaxing yet exciting tour out on the water will have you feeling connected with the ocean once more. Are you already a Florida fishing pro? Take your gear down to the bustling Russell-Fields Pier for a great independent fishing destination. The pier is a quarter mile long, providing plenty of space to cast into the sparkling sea below. With just a glance into the water, you’re able to see exuberant marine life moving swiftly through the clear waves. Even more, take advantage of the excellent restaurants just across the street at Pier Park to refuel after an afternoon of fishing. The pier is a beautiful location and a great place to spend an afternoon in the sunshine state. Take the Bait: Book with Adagio Today! Your ocean experience doesn’t have to end when you return from your Florida panhandle fishing excursion. 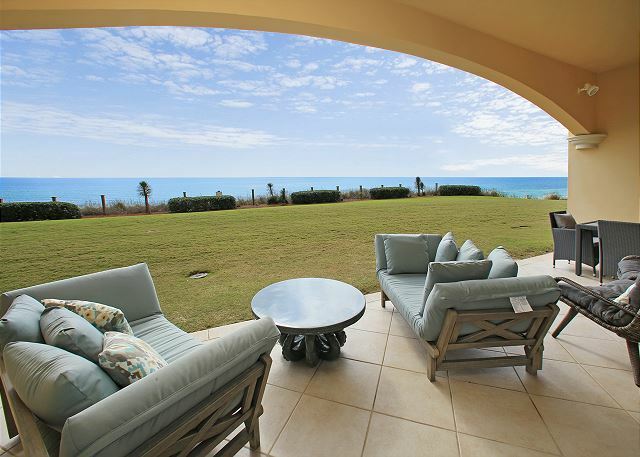 When you stay in a gulfside room, you gain stunning panoramic views of the mesmerizing sea. Book the Adagio C-103 Suite to take advantage of these views as well as convenient first-floor beach access. If you crave the ocean, this accommodation makes it simple to jump out of bed and begin your day enjoying the panhandle shores. We hope to see you soon!